It’s appalling. California’s pension fund (CalPERS)—the largest public pension fund in the nation—has invested more than $25 million in companies that directly support the torture and abuse of LGBT youth: mail.ru and MegaFon. These companies are tied to VK.Com, the Russian internet company that has allowed Occupy Pedophilia to post videos of LGBT teenagers being kidnapped, tortured, and beaten, encouraging copycat attacks on LGBT youth, and putting youth in further danger by outing them to their families and anti-LGBT gangs in Russian. Urge CalPERS to stop investing in mail.ru and MegaFon now! 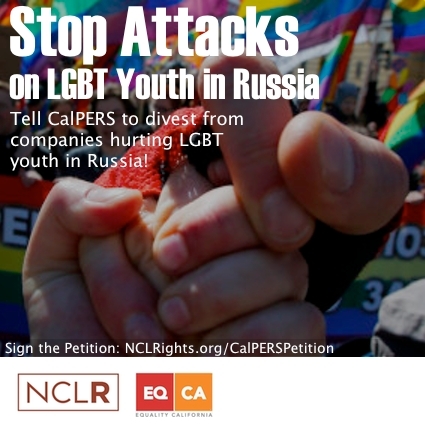 By investing in these and other Russian companies, CalPERS is supporting the Russian government which just last year enacted laws that criminalize people for being LGBT or simply for speaking out in favor of LGBT rights. Tell CalPERS to stop supporting anti-LGBT laws with taxpayer money! The California State Senate has already passed a resolution authored by Senator Mark Leno and sponsored by Equality California and the National Center for Lesbian Rights calling on CalPERS to end investments in Russia due to its anti-LGBT laws. While CalPERS says it condemns what is happening in Russia, it continues to provide money not just to Russian businesses, but to businesses that are directly harming and exploiting LGBT youth. ​This is morally unacceptable and fiscally unwise. Surely, California resources can be better spent than investing in companies that place LGBT youth in jeopardy. Stand with NCLR and Equality California as we call on CalPERS to do what’s right for LGBT young people. Please sign this petition demanding that California’s pension systems—CalPERS—pull its investments from these companies immediately and publicly condemn what is happening in Russia. If CalPERS divests, it will send a powerful message to these companies that they must end their horrific behavior. After you have signed the petition, please share it with your family and friends by email, Facebook, and Twitter, asking them to also sign and share it. Don’t forget to tag @CalPERS and use #SupportLGBTYouth. We cannot sit silent while LGBT youth suffer.